President Donald Trump signed a two-year budget agreement that will boost federal spending by almost $300 billion and suspend the debt ceiling for a year, ending a brief partial government shutdown that began at midnight when lawmakers missed a funding deadline. 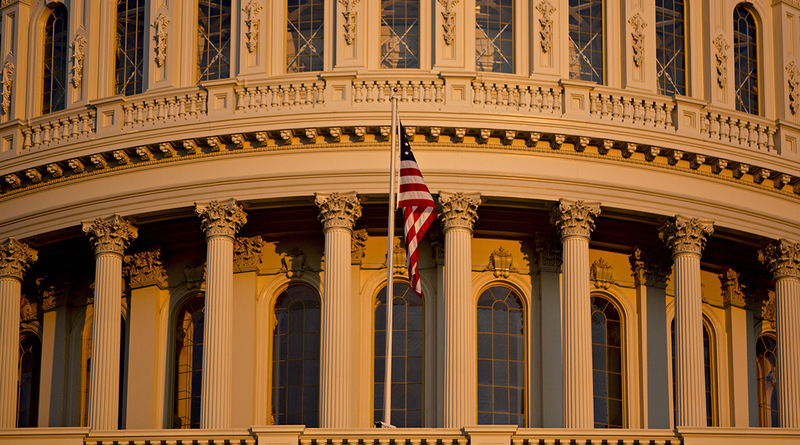 Congress passed the measure before dawn on Feb. 9. The 240-186 House vote overcame opposition from many Democrats and a faction of GOP conservatives. The Senate passed the bill earlier Feb. 9, 71-28. “Without more Republicans in Congress, we were forced to increase spending on things we do not like or want in order to finally, after many years of depletion, take care of our Military,” Trump tweeted. The drama played out against a backdrop of tumbling global stock markets. The benchmark S&P 500 index fell 3.75% Feb. 8 — down more than 10% since its Jan. 26 peak. Indexes bounced back from the Feb. 8 big losses, but stocks remain on track for their worst week in more than a year as interest-rate fears haunt investors. The budget accord got delayed in the Senate past the midnight deadline despite a strong endorsement from Majority Leader Mitch McConnell of Kentucky and Democratic leader Chuck Schumer of New York and backing from Trump. Republican Senator Rand Paul of Kentucky, protesting the huge spending increases that are central to the deal, delayed action for most of Feb. 8 by demanding a vote on an amendment to keep existing budget limits in place. The nonpartisan Committee for a Responsible Federal Budget, analyzing a report from the Congressional Budget Office, said the deal would add a net $320 billion to deficits over a decade, or $418 billion counting the additional interest costs. That’s in addition to the estimated $1 trillion added to the deficit over a decade by the Republican tax cut legislation passed in December. America’s top credit rating is likely to face downward pressure in the years to come because of the swelling national debt and widening budget deficits, Moody’s Investors Service said in a report Feb. 9. In the House, Democratic leader Nancy Pelosi called the agreement “a good bill” but said she would vote against it because House Speaker Paul Ryan refused to promise an open debate and vote on immigration legislation. Many Democrats lined up behind Pelosi, with 119 voting against the measure and 73 voting in favor. Ryan has promised to bring up an immigration bill “that the president will sign,” which fell short of demands from Democrats. “That’s not a commitment,” Pelosi said on the House floor. Representative Luis Gutierrez, an Illinois Democrat, urged his party to kill the spending bill unless it also protected young immigrants who were brought to the U.S. illegally as children and have been shielded under the soon-to-end Deferred Action for Childhood Arrivals program. He said that if the legislation passed, “all the leverage is gone” to force a solution for the young immigrants. Ryan made a public pitch for votes on Feb. 8, emphasizing the increased funding for the Pentagon to assuage the concerns of Republicans who said they would vote no because the plan also raised spending on domestic programs. “Neither side got everything it wanted in this agreement, but we reached a bipartisan compromise that puts the safety and well-being of the American people first,” Ryan said in a statement after the measure passed. Prior to the Senate adjourning just before 2 a.m., McConnell set up a procedural vote for Feb. 12 on shell legislation that will be used as the vehicle for the chamber’s debate on immigration. That was a key part of his agreement with Schumer that ended the last shutdown and led to the budget deal. The budget measure, H.R. 1892, will temporarily finance the government at current levels through March 23 while lawmakers fill in the details on longer-term spending, which includes raising the caps on defense spending by $80 billion over current law in this fiscal year and $85 billion in the one that begins Oct. 1. Non-defense spending will rise by $63 billion this year and $68 billion next year. It’s filled with long-stalled or long-sought priorities for both sides. Republican defense hawks get more funds for the military, while Democrats get extra money for domestic priorities like combating opioid addiction, the National Institutes of Health budget and community health centers. The agreement also repeals a piece of Obamacare — a Medicare cost-cutting board aimed at ensuring the program’s long-term solvency. And it provides $90 billion in disaster assistance for California, Texas, Florida, Puerto Rico and the U.S. Virgin Islands. The bill authorizes the sale of 100 million barrels from the Strategic Oil Reserve to pay for some of the new spending, and raises customs and airport security fees in the next decade. It also renews a number of expired tax breaks for calendar 2017 including for cellulosic biofuel, while extending a nuclear power tax credit that was scheduled to expire so that it is available after 2020.